To order back numbers of current titles please visit the magazines' web sites listed in the Links section. A selection of cuttings from the motoring magazines concerning MMOC cars, members and events. New Kit Car Mini-Marcos - Motoring News leads with the announcement on page 2. First ad for Mini Marcos. First race - first win: Geoff Mabbs laps all but one at wet Castle Combe. Le Mans 1966 - Only British car to survive. Le Marcos de Marnat/Ballot-Léna ... conquit la sympathie du public. Mini Supplement - Mini Marcos with Le Mans '66 photo. “From rust to riches - Build Your Own Marcos GT” - three part series on turning a rusty Mini Van into a gleaming Mini Marcos Mk.III. It's a full blow-by-blow account including renovation of the donor parts, tools and full costings. The whole project came in at under £400, plus another £100 for a set of Minilites and SP3s. MARCOS 50: Prouver en Europe qu’elle peut rouler 24 heures. “Mini Based Specials” - a review of a clutch of Mini specials. Article from an unidentified South African magazine on the Raubenheimer Mini Marcos. “Let's Go!” - Issue number 1 blasts off with a Mini Marcos and a two-part article on building a Mini Jem. Build a Mini Jem for under £350. “Burn Rubber!” - Paul Davies provides an introduction to drag racing and finds a Mini Marcos at Santa Pod. Qcar features the Mk. III Mini Marcos factory demonstrator, LAM 101F: “Performancewise, It's the Maxi-Mini”. “Go Custom” - Tony Bostock reviews the kits and bits, including Mini Jem and Mini Marcos. Mini Jem: review of Mk.2 from Fellpoint (photo is a Mk.1). See this article on Minijem Plus. “The Thoroughly Modern Mini” - Mini Jem. “Kit Cars Compared” - Paul Davies tests the Mini Jem Mk. II and Mini Marcos Mk. III (GBH 771G and LAM 101F). Jem Talk by Richard Hudson-Evans. “Marcos Revived” by Peter Filby. Mini Marcos and Mini Jem. “One of the Rest” - Terry Grimwood tries out Steve Roberts’s TransXL Mini Marcos Mk.III. This issue carries an article on Ian Hall's Mini Jem racer. This adapted version is from MMOC Magazine number 65 (Autumn 1997). “Mini Marcos Lives On” - Peter Filby reports on the D & H Fibregalss Techniques Mini Marcos Mk. IV. this scan was taken from a reprint used by D & H for promotional purposes. The denim skirt looks more dated than the Mini Marcos! Two-part article by Chris Horton on stripping and preparing the donor parts, and building the Mini Marcos Mk. IV kit. “Being There - 5” - Steven Roberts's Trans-XL Mini Marcos. “Deutsche Marcos” - Roger Young’s Mini Marcos Mk.IV no. 8066. Robin Bye tells the story of Morten Deenfort's Mini Marcos Mk. IV, number 8081. Track Test: Mighty Mini - Neil Roscoe’s ex-TransXL Mini Marcos. Club Chat: There’s Plenty Going On at the Mini Marcos Owners Club. Marque time: Roger Crowhurst with MMOC news and Newark '90 pic. Club Chat: Anticipating the Stoneleigh rebuild. Pickett’s Lock Show; Mini Marcos Revived. Culture Shock: True Brits - clips from a feature article on Marcos. c) Speedex ad for the relaunched Mini Marcos. The Mini Marcos Is Back. A Good Bit of Kit - Steve Bennett compared the Mini Marcos Mk.V, Midas and a brace of GTMs. Plastic Pig Without Poke - Shaun Campbell drives the Mini Marcos Mk.V. Marque time: Roger Crowhurst’ Mini Marcos. Mini Marvel: Peter Cahill talks to Jem Marsh about the history of the Mini Marcos. “Plastic Toad” - John Pressnell tries out the Mini Marcos Mk. V and talks to Jem Marsh. Mini Mania - review of Mini-based Kit Cars: Mini Marcos. Fresh Air Marcos - pvc sunroof available for the Mk.V Mini Marcos. 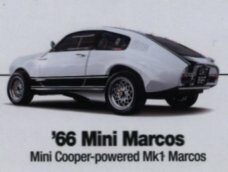 Mini Marcos O.C. - Peter Cahill looks at one of the liveliest clubs around. Wolfgang Buchta does a night rally in Mini Marcos 8050. “Sweet & Low” - Mini Sprint and Mini Marcos. “Top Gear” is to journalism what Jeffrey Archer is to literature. If you watch the programme you'll know what to expect, but unless you enjoy watching rubber being burned up mindlessly whilst going nowhere in particular you probably won't. Come back Tony Mason, all is forgiven! This article is a shocker. The hack concerned, Nik Berg, obviously doesn't like the Mini Marcos, and makes his feelings plain. In that case why bother to write about it? Save your vitriol for the likes of Ford and Vauxhall! Actually, from a programme that selects as its "Car of the Year" in 1999 one that is absolutely hideous when viewed from any angle inside or out, and then picks and even greater visual disaster in 2000, it comes as no surprise. Berg completely misses the point about the Mini Marcos, reviewing it as a £14,500 production car not a cheap and cheerful £3,000 kit car. The higher price is what Marcos charged the Japanese for a fully built car with brand new Mini components and air conditioning. He also missed the interesting connection between the Mini Sprint and the Mini Marcos - Rob Walker - and he can't spell Corsley anyway. Hot Stuff - heated rear window for the Mini Marcos. Erik Wijn tells the story of his Mini Marcos Mk.IV (in Dutch). Bakvagnen: Mini-invasion i Småland - IMM 1995 at High Chapparal. Me and My Car: A sports Mini that makes boys of men. Alan Duggan talks to André Krige about his pride and joy, South African built Mini Marcos CFM 47558. The caption reads “Handles like a go-kart, goes like a bomb...”. Ad: Great Western Kit and Sports Car Show. Two articles mention Mini Marcos in this French magazine: the club contingent was photographed at Château d'O on the way to Le Mans and an item on Miniatures includes a model of the 1967 Le Mans car. Club Chat - Richard Heseltine picks over the MMOC Magazine. Mini Kits - Chris Rees's survey of Mini-based kitcars includes Mini Marcos and Mini Jem. Letters - one from Richard Porter. The Flying Custard Tart” - Colin Hedgecock's Mk. 2 Mini Jem, Q296 JTA. Showtime: Chatham Shines. Richard Porter’s Mini Jem Mk.2. In the Club: What’s a Kingfisher? Hay Fever - Hay motorkhana event from Australia, including Taylorspeed Jem photo. Club Chat - MMOC Magazine. Photo of Mark Noonan’s Mini Marcos Mk.IV. In the Xlub: Kingfishing for Compliments. Minis out in force at Gaydon. Streamliner: David Pounder’s Mini Marcos Mk.III. “Buyers Guide - Mini Marcos” - two page feature with photos and artists' impressions. Inset item on Mark Nolan's Mk 1 racer for sale at £8,000. Fact file gives prices, checklist and club information. Also mentions Mini Jem - “infinitely prettier than its Marcos half-brother”. A good article unfortunately spoilt by factual errors. Rencontre: Claude Ballot-Léna - profile of the driver with a classic photo of the Mini Marcos at Le Mans in '66. Slippery Customer - Owen Smith’s Mini Marcos Mk.1.4. Group Test - Something old, something new, something borrowed. “Something Old, Something New, Something Borrowed” - eight kit cars compared at Llandow Circuit in Wales, featuring Colin Hedgcock's Mk. 2 Mini Jem, Q296 JTA, aka La Crème Anglaise. Glorious Newark - Mini Marcos Club stand well supported. Historische rally’s: Op Randje van Regelmatigheit. Also Mini Marcos Euregio Meeting preview. IMM '98 - Marcos/Jem owners gather round to help. Mini in the Park - Stunning display of Marcos models. A collection of reports on the first International Mini Marcos Euregio Meeting in Brabant, The Netherlands, September 26th - 27th. The next four articles are in Dutch and were published in the Netherlands and Belgium. “Alto Ego” - Feature on Geoffrey King's Alto Duo, Q250 GFV. News: Mini Marcos Euregio Meeting. Buyers Datafile: Mini Marcos & Mini Jem. Clubs: Europeans Join Forces - report on Euregio Meeting. Club Corner: It's no wind-up - Japan Mini Day with Marcos and Jem. News: Mini-Blooper - “Scots Mini Weekend” photo is Mini Marcos line-up at Mini in the Park. Cover shows a Mini Marcos Mk. IV at Goodwood, but whose? Out and About: Minis major on Beatlemania - report on Stoneleigh Mini Show at Easter weekend. Bristol Mini Day - aerial photo of Mini 40 display. Kit Cars - The First 50 Years, Part Two - Growing Up: the second part of Malcolm McKay's series featuring “The Mini Men”. Kit Cars - The First 50 Years: Mini Jem and Mini Marcos. Problem Page - Auntie Iain's Bloomers. Marque Time (Club News) - Multi-Cultural Marcos. “Une Bombe en kit” - the cover story features Jean-Marc Prat's Mini Jem Mk.II, RT M2 1198. This article is on MiniJem Plus. Club Chat - Stent picks up the MMOC Winter Mag. Silverbröllop - Ian and Margaret Hayward's silver wedding trip to the midnight sun (Swedish with English translation). Iain Ayre enthuses over Peter Hanman’s Mini Marcos Mk.III, MM 7257. London to Brighton Mini Run, 21 May 2000. Clubs: Classic Kits Star in Cheshire - report on the Cheshire Kit Car Show. Fine Display at IMM 2000; 6007 at Scottish Mini Weekend. “Quality Finish” - report on the Three Counties Kit Car Show at Malvern, including Alan Jeffery's award-winning Kingfisher Sprint. CLUBS AND EVENTS with Iain Ayre: Are you too sensible? KC picks up on the club's Arctic Circle Adventure. Poster Calendar for 2001, featuring Mk. III Mini Marcos for January. Mini Ha-Ha: Peter Cahill concludes a Mini Tribute with a look at Mini specials and fun cars. “Stepping Out” - Mini World Action Day 2000. The photo montage includes Allan Brown's Mini Marcos Mk. III. Feature on Ian Johnson's Mini Marcos Mk.III, MM 7499. “The World's Biggest Mini Only Event” - Mini Mag's ad for Mini In The Park 2001 includes a shot of the club stand in 2000. This ad is also included in the June and July issues, of which the former has an interesting article on Brian Luff's Status 365 and Minipower. Club Chat - Mini Marcos Mania. Amy Filby notes the MMOC Magazine coverage of the closure of the Marcos factory in Westbury. Also in this edition are a feature article on Midas and shorter items on ABS Freestyle, Siva and Domino. Hints & Tips - Hot Marcos-Cooper. Neil Davies answers an engine question from Paul Darren. Maarten Krikken's Mini Marcos is pictured. Club Chat - Mini Marcos Merits. This time Amy picks up our Autumn Magazine and make the most of Miss Kit Car at the Newark Show. Workshop Q&A with Iain Ayre - Period Pains. The writer answers a question about cracks and tyres, with a picture of Pete Crudgington's Mini Marcos at Stoneleigh. “Plastic Surgery”: Martyn Jones compares Dave Pounder's Mk. III Mini Marcos with a GTM Coupé. Stepping Out - Miniworld reviews the Mini shows. Photo shows the Mini Marcos line-up at Castle Combe. Clubland - double stamps in this issue as an unidentified Jem is pictured on a London & Surrey treasure hunt. Workshop - Q & A: “Rattle and Whine”. Ian Ayre answers a reader's question on beefing up a tired and noisy engine. Richard Porter has a whinge about speed humps. Classic Kits - Hamblin Cadet: Martyn Jones tells the story of S.E. Hamblin Limited, one of the pioneers of fibreglass bodied kit cars. Motorists' Forum - Calling Mini Marcos Fans. Ian Allbon tries to contact more owners in South Africa. Yes July, and it's only mid-May! Roger and Melanie Garland are seen at Aston hall, Birmingham with their Mk. V Mini Marcos. Club Chat - Spotlight on the Mini Marcos Owners Club. Goodwood Revival Meeting - Marcos hero Davis. Club Chat: Mini Marcos Moans - Amy Filby picks up on the originality debate. Mini Marcos Group Goes Dutch for 6th Euregio Meeting. Andrew Charman visits Goodwood hero Rae Davis and his Mini Marcos Mk.III. Club Chat: Messed-up Marcoses - Paul Harcourt's rescue mission. Mini Marcoses at Bo'ness, Essen and Brighton. Club Chat: Mini Marcos Charity - Mencap run. Race Ace Rae gets down the cafe - Rae Davis at the Ace Café London. Frank Willard's Mini Marcos at Mini In The Park 45 at Silverstone. Report of the Mini 45 Races at Silverstone, which grudgingly acknowledges Ollie Howell's victory in the "Fastest Mini In The World" races with Pete Crudgington's Mini Marcos. They seemed to be a bit upset that a 1380 5-port A-series car had beaten all the Vauxhall-engined, space-framed, twin-engined, supercharged BMW stuff, not to mention Bill Richards's Metro. Not worth the bother of scanning. See also Sport Scene. 15 Minutes of Fame: Mini-Marcos Le Mans 24 Hours, 1966 by Richard Heseltine. On Your Marcos: Rae Davis’s Mini Marcos Mk.III. Star Letter: Marcos Mantra - Billy Dulles replies to the previous article. Ace Café - Mini kit cars at the Italian Job Night. Miniworld Action Day - Pete Crudgington's Mini Marcos at Castle Combe. “The Comeback Kid” - Paul Chudecki on the relaunch of the Mini Marcos by Marcos Heritage. Autosport 2005 - Rae Davis's Mini Marcos at the NEC show. “Exclusive: Back to the Future” - Martyn Morgan-Jones gets a test drive in the new Mini Marcos Mk.VI demonstrator and produces another seven-page epic extolling its virtues. Mini Marcos: National Treasure - history up to Heritage Mk.VI. Second Coming: Rae Davis’s Mini Marcos at Stoneleigh International Motorsport Show. Pete Crudgington’s Mini Marcos Mk.IV vs a Raw Striker. London to Brighton 15 May 2005 - MiniWorld's photographer catches webmaster's Mini Marcos Mk.IV on the way to the seaside (right). Your Say - MOC display at Brighton for the London-Brighton Classic Car Run, including Mini Jem and Midas. Just a spall pic of Pete Crudgington's Granny Smith Racing Mini Marcos at the magazine's Sandown Park show in August. ”Return of a Legend” - an enthusiastic review by Rob Hawkins which includes driving the Mini Marcos Mk. VI demonstrator and going through the build process, some of which can be done with the shell upside down! Speed of Light: Pete Crudgington’s Mini Marcos Mk.IV, plus MotorMouth - Rob Hawkins reviews the new Mk.VI Marcos kit. Letters: Bring It Over Here / Return of a Legend? Italian Job Fundraiser - Sam Smith reports on the Mini Bandits' IJ Night at the Ace Café London. Amy Filby notices a Unipower GT in the Club Mag. Kay Drury finds webmaster's Mini Marcos at Bromley Pageant. Marcos Heritage sells three Mk.VI kits to Japan. Hynesight: the editor recalls the Mini Marcos exploits in the 1966 Le Mans 24 hour race. Hynesight: A Car For All Reasons. News: Mini Marcos Makes It To Japan. Marcos Heritage Mk. VI and enthuses about almost everything except its aesthetic appeal! Four Mini Marcoses and a Jem among the pictures from Castle Combe. Company Report: Marcos Heritage Spares by Peter Filby. This is a four-page feature with photos of the Heritage Mk.VI and GT, and their bigger sisters. I Love Mini: Racing Legend - Andy Seward's Mini Marcos Mk. III. Howard Plant's Mini Marcos at Stoneleigh. Mighty Work on a Mini Marcos: Kjell Wiklund's 19-year restoration project. Mini Marcoses at Gaydon and Gunwharf Quays. Richard Porter's Mini Marcos at Minis on the Rec. Ian Ayre looks for a Mini Marcos for Classic Le Mans. Patrimoine Mini: Mk.I and Mk.III Mini Marocses compared. Beat the Speed Police: six classics compared. Ian Ayre looks at Marcos Heritage and contemplates a VTEC Mini Marcos. Malvern Mini Show 2007: Mini kit cars are there too. Techno Classica, Essen and Brooklands Mini Day. Brooklands Mini Day: Mini Marcos (ahem!) gives it some up the test hill. Iain Ayre considers a Marcos for a European tour, and a rather old pic. Only a small pic of Richard Porter’s Mini Jem at Beaulieu. The Special Minis - Marcos Heritage Mk. VI. Simon Cooke spots the MMOC duo at Bristol Mini Show. Kit Car Guide - Marcos. Santa's Here: pic of the Mini Marcos stand at Mini In The Park at Santa Pod. Eight page review covering a wide range of kits from the AC Donington to the Whitby Warrior, including Mini Jem and Mini Marcos. This Life: Mini Marcos - another Santa Pod pic. Stefan Wray's D.A.R.T at Goodwood's Dizzy Addicott appreciation. 50 Years of Marcos - Prescott news release. Tim Neal's Mini Jem picked as Car of the Show at Trentham Park (NZ). Mini kit cars line up at Newark Show. Richard Porter at Gaydon, Marcos Honda in Wisconsin and DART at Goodwood, not to mention a Unipower GT and a Broadspeed GT. 50 Years and Counting - Group test including Andy Roberts’s Mini Marcos Mk. IV. Inbox: Hannes van Wyk writes from South Africa. Happy Birthday Marcos - with Andrew Tyndale's Jem! World of Minis: Shows - Scottish Mini 50 Show - Mini Jem illstrates Marcos 50th. Italo Sciacca sketches out some ideas for a radically updated Mini Marcos. Nicolas Pinon's racing Mini Marcos is featured in this French magazine. Show Report - National Mini Cooper Day, Beaulieu. Cover photo by Vic Hemderson showing Bob Polak’s Mini Marcos (7104). “Fresh Ayre - Mini Marcos” - Iain Ayre gets down to building a previously untouched Mini Marcos Mk.IV. “Racing Heritage” - Five page feature by Jon Betts on Karsten Gärtner’s Mini Marcos Mk.IV. Excellent photography by Alisdair Cusick. Goodwood Revival: Mini derivatives and kit cars mixing it up. Our Minis: Iain Ayre clears a bit of space in Vancouver. A-Z Guide: Marcos - November 2008 entry recycled. Between The Lines: Bob Hart shares his memories with Kay Drury. The Display Cabinet: Stafford Show - Iain Ayre parks the Mk.VI demonstrator on the magazine's stand. The Display Cabinet: Genuine Kitcar Show - Preview of the Stafford show in September including the Mk.VI demonstrator. News: Prescott Hillclimb - Mike White on the hill. Out & About: Le Mans 24-Hour - Frank Morskate’ Mk.III Mini Marcos. Our Minis: David Lockhart, 10 Year Rebuild - Fujio Wako's Mini Marcos in Japan. “David Lockhart: 10 Year Rebuild” - Two page feature on Fujio Wako's Mini Marcos Mk. IV, DH8026. Event: West Midland Mini Show & Oval Challenge - good turn-out from the MMOC. Show Report: Mini Meet North at Mosport, Canada - Bob Polak's Mini Marcos. Featuring Midas, Mini Marcos and GTM, including Michael Schellenberger’ Mini Marcos Mk.V, 9002. British Mini Fair: Twin Kam Mini Marcos at Bingley Hall. Deep Sanderson 301 entered in Le mans Classic. a Japanese Mini Marcos in the Hamamatsu Historic Car Parade. Fresh Ayre: Hands On Mini Marcos - fitting the rear hatch window. Techno Classica 2012: Dirk Palapys’s Mini Marcos Mk.IV stars. Hole Story: Kingfisher Sprint 1980-85 plus Sussex Kitcars profile. Jem’s Pocket Rocket - James Elliott drives Mini Marcos 7030. Event: West Midland Mini Show & Oval Experience - Richard Porter on the track. Matthew Paynes Mini Marcos DH8411 in the Mini Fair 2013 preview. Jean-François Bardet’s Mini Marcos Mk.IV at Angoulême. Bet Fair: Jon Cass reviews Peter Skitt’s just restored Mini Marcos Mk.I. Fresh Ayre: Iain fabricates the petrol tank. Kevin Mitchell’s Mini Marcos Mk.IV at Classics at the Mill. Top Ten Mini Makeovers - Mini Marcos is no.1 (of course). Cake Corner - Tony Fysh’s Jem-shaped 60th birthday cake. Mini’s Greatest Hits - Mini Marcos. Mini Scene: Le Mans Classic 2014 - two Mini Marcoses and a Deep Sanderson 391. Show Report: Mini World Action Day at Castle Combe. Elite of the Illegitimates: Mini Marcos and Ogle SX1000. Auto Retro Show Barcelona: Ivan Classics Mini Marcos, plus a bonus Jem. Auction Round-up: Anglia Car Auctions. It’s Garden Party Time: Classics on the Green, Croxley Green. News: Shelsley Walsh Classic Hillclimb. Event Report: Saint Goueno Masters Hillclimb. Event Reports: Minis by the Sea, Worthing and Mini Action Day, Castle Combe. News: Castle Combe Autumn Classic. Comment: Outside View - Richard Heseltine marks the Mini Marcos’s 50th anniversary. Out and About: Spa Six Hours - Mini Marcos Mk.III at Francorchamps. Between the Lines: What makes a classic kit? News: Le Mans Mini Marcos Found. Event Report: Autosport International with Cody Tree’s Mini Marcos Mk.IV. Our Minis: Road and Track - Iain Ayre reprieves Pimple. Event Report: London Classic Car Show with Cody Tree’s Mini Marcos Mk.IV. Workshop: Reader’ Build - Cody Tree’s Mini Marcos Mk. IV. Our Minis: Jeroen Booij lookd for identification marks on the Le Mans Mini Marcos. Our Minis: Jeroen Booij takes the Le Mans Mini Marcos to Blyton Park. Our Minis: Jeroen Booij finds out more about the Le Mans Mini Marcos. Mini Jems at Kop Hill Climb and Montlhèry. Road Trip: Road to Le Mans Classic. Industry Greats: Jem Marsh and Marcos Cars. Our Minis: Jeroen Booij works on the floor of the Le Mans Mini Marcos. Our Minis: Jeroen Booij prepares the shell of the Le Mans Mini Marcos for painting.